On Sunday, October 31, Dee and I went off to Darlington, UK, to train in Iaido with the thought that one or both of us would grade. Once there, Dee opted out of grading and I decided to go for it. Dee, it’s fair to say, is far more accomplished in Iaido than I am. I have too many preconceived ideas about the art. Added to that, I’ve far too much muscle memory from years of Karate which kicks in; not to mention my natural aggression, which, when practicing Kenpo or Karate, comes over as cold and clinical. I never lose my attitude and simply move through the opponent. I tend only to use minimum movement and effort for maximum result. However in Iaido it all goes out of the window. I use strength, not skill. In addition, my posture is one of forward bow, totally unlike the stances of Iaido. My hakama looks as if it was tied by a blind man in a thunder storm. All in all I am to keen to get to grips with my opponent whether it’s the guy in front, behind or wherever of me, as soon as possible. Oh boy did the testing go wrong. The Sensei, who was in my line, pulled me about my posture. “Sorry Sensei, it’s just too long at Karate” I remarked. “You are not doing karate!” he thundered. Whoops, bad start. “Who is your Sensei?” asked the gentleman. I then proceeded to get rubbished for everything, including for using a wooden bokken. “Are you grading with it?” the Sensei bellowed. “No Sensei I will use another blade” I remarked. “Well use it now” he exclaimed. “Not able to Sensei, my wife has it.” I responded. Another tirade as he thundered off muttering something about not being prepared. He was not aware that my nearly 200 year old blade is away being repaired. At the break, I tried to explain this, but was greeted with another rolling of the eyes. Another Sensei had had a go at Dee, which put me in train mode, as in “Look out there is a train coming”. My test was a shambles. I moved too fast, my cuts weren't deep enough. I might have even missed out a Noto (re-sheathing of the sword). Stance, in my opinion, must have been OK, because my back aches today. I never went to the board to look at the score. So what’s the result of all this you ask? 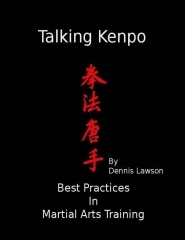 Well it’s about a learning curve and remembering Kenpo’s Orange Belt Pledge. As a 5th Degree Wado Ryu, a 1st in Chinese Kenpo plus the 1st I got from Tae Kwon Do and the 2nd Degree in Ed Parker's American Kenpo Karate, as well as some Judo, I should know something about martial arts. At the end for my Enbu (paired exercise with an opponent) I decided to go for the Kill and concentrate on my tormentor, did it work? NO because all he saw was an old guy with a borrowed blade looking to kill him; emotion had taken over. “8 times down nine times up” as Sensei Funakoshi once said. I was overall rubbish which was nobody's fault but mine. To the gang who surround us at Iaido and who have been so supportive, I would like to say thanks; In particular to Senseis Martin and John, and Andrew, of course. To Dee who was ready to give me a hug when I came off, I offer special thanks. My work this coming weekend, with the 7 Provisional Black Belts and the rest of the Cumbria People, will see a perhaps more contrite Mike Ilderton.